Leonard Benjamen Wevik married Olga Engelbrecht, daughter of Henry Engelbrecht and Margaret Hagge, on 5 October 1929. Leonard Benjamen Wevik witnessed the burial of Isaac Olsen Lykken Sr. after 12 December 1937 at Roseni Lutheran Church Cemetery, Beresford, Union, South Dakota; Gr 4, Lot 3, Blk 3; Isaac Lykken Sr funeral notice. Leonard Benjamen Wevik died on 6 November 1963 at age 62 Remsen Police Chief Leonard V. Wevik, 62, was dead on the arrival of a physician about 10:30 a.m. Wednesday after suffering a heart attack at the wheel of the town's police car. According to E. F. Kieffer of the Remsen Bell-Enterprise, the police car jumped a curb on the east side of the public school building and struck a large tree. The police chief was returning from the east edge of Remsen, where he had been engaged in clearing traffic after a fire alarm, when he was stricken. The blaze was a brush fire at the Darrell Pecks farm. Chief Wevik joined the two-man Remsen police department June 1, 1937, serving as police chief most of that time, Mr. Kieffer reported. Born April 26, 1901, at Beresford, S. D., Mr. Wevik moved to Remsen 40 years ago as a farmhand. 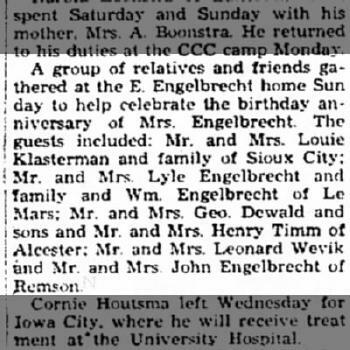 His marriage to Olga Engelbrecht took place Oct. 5, 1929, at Dakota City, Neb. Surviving are his wife; a daughter, Mrs. Lawrence Parrish of South Sioux City, Neb; a month-old granddaughter, Brenda Lee Parrish; three sisters and a brother. The body was taken to the Moeller funeral home, Remsen. Funeral arrangements are pending. Le Mars Daily Sentinel, Nov. 6, 1963. He was buried after 6 November 1963 at Remsen Cemetery, Remsen, Plymouth, Iowa. 1 January 1925 Meadow, Plymouth, Iowa Leonard Benjamen Wevik appeared on the census of 1 January 1925 at Meadow, Plymouth, Iowa, living next door to Emil Engelbrecht. Leonard Benjamen Wevik was a local chief of police in August 1951 at LeMars, Plymouth, Iowa. 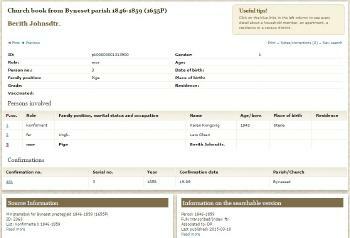 [S9] South Dakota, South Dakota Birth Records South Dakota, State File Number: 776579 (unknown file date). [S250] U.S. Federal Census 1930 U.S. Federal Census, by Ancestry.com, ED75-29. Dwelling 308. Name Variation Mabel Grace Wevik was also known as Grace Mabel. Married Name 27 July 1921 As of 27 July 1921,her married name was Engelbrecht. Mabel Grace Wevik died on 30 November 1965 at age 62 Mrs Emil Engelbrecht (Mabel Wevik) obituary. She was buried after 30 November 1965 at Memorial Cemetery, LeMars, Plymouth, Iowa. 1 January 1925 Meadow, Plymouth, Iowa Mabel Grace Wevik is listed as wife on the census of 1 January 1925 in the household of Emil Julius Engelbrecht at Meadow, Plymouth, Iowa; living between Frank Engelbrecht and Leonard Wevik. On 7 May 1939 at Mrs. Emil Engelbrecht (Grace Wevik) birthday party. On 5 January 1940 at Emil and Grace Wevik Engelbrecht and daughters visited Mrs. Lizzie Wevik. Mabel Grace Wevik and Emil Julius Engelbrecht lived in July 1951 at Remsen, Plymouth, Iowa. Mabel Grace Wevik was a witness when Emil Fred Klemme and Anna Marie Lykken were The 13th annual Lykken reunion was held Sunday, August 17, at the home of Mr. And Mrs. Emil Klemme at Akron. 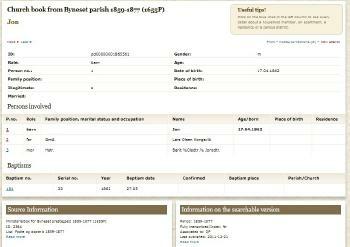 [S9] South Dakota, South Dakota Birth Records South Dakota, State File Number: 777658 (unknown file date). [S250] U.S. Federal Census 1930 U.S. Federal Census, by Ancestry.com, ED75-23. Dwelling 34. Name Variation Helen Gladys Wevik was also known as Helen E.
Married Name 24 November 1926 As of 24 November 1926,her married name was Lakness. Married Name 7 April 1962 As of 7 April 1962,her married name was Pearson. Helen Gladys Wevik died on 2 August 1983 at age 78. Helen Gladys Wevik obtained US Social Security Card at Illinois; last residence Chicago, Cook, Illinois. She and Anton L. Lakness lived in July 1951 at Chicago, Cook, Illinois. 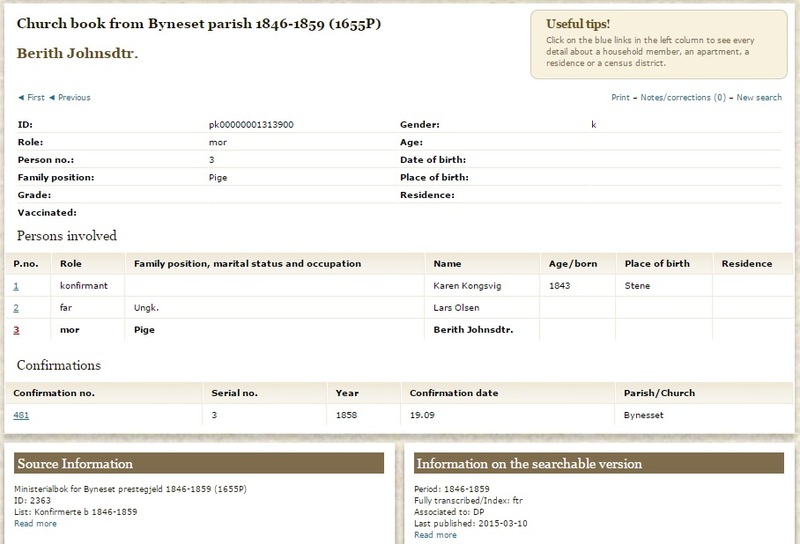 [S9] South Dakota, South Dakota Birth Records South Dakota, State File Number: 559586 (unknown file date). [S250] U.S. Federal Census 1930 U.S. Federal Census, by Ancestry.com, ED16-1217. Dwelling 132-198. [S373] U.S. Federal Census 1940 U.S. Federal Census, by Ancestry.com, Year: 1940; Census Place: Chicago, Cook, Illinois; Roll: m-t0627-00989; Page: 4A; Enumeration District: 103-2127. Name Variation Ole O. T. Wevik was also known as Ole Ingman Theopholus. Ole O. T. Wevik was born on 9 March 1907 at Union, South Dakota. Ole O. T. Wevik died on 6 August 1974 at Alsen, Union, South Dakota, at age 67. He was buried after 6 August 1974 at Emmanuel Lutheran Cemetery, Beresford, Union, South Dakota. Ole O. T. Wevik obtained US Social Security Card at South Dakota. He purchased land on 15 April 1912 at Butte, South Dakota, Ole Wevik, Meridian 07 - Black Hills Meridian -- located on the SD - WY border, Twp: 14N, Range: 7E, section 26, 160 acres, casetype 272002, patent, doc 259242, date 04/15/1912. [S250] U.S. Federal Census 1930 U.S. Federal Census, by Ancestry.com, ED81-45. Dwelling 375-403. Married Name 14 March 1914 As of 14 March 1914,her married name was Wevik. She was the daughter of Even Ingebretsen Husby and Johanna Steffensdatter Olson. Ida Husby married Alfred O. Wevik, son of Ole Olsen Wevik and Lizzie Solem, on 14 March 1914 at Romsdal Lutheran Church, Beresford, Union, South Dakota. She was buried after 24 March 1980 at Roseni Lutheran Church Cemetery, Beresford, Union, South Dakota. Ida Husby obtained US Social Security Card at South Dakota; last residence Sioux Falls, Minnehaha, South Dakota..
[S9] South Dakota, South Dakota Birth Records South Dakota, State File Number: 534675 (unknown file date). [S184] Beresford Republic Newspaper, Obituary April 3, 1980. [S245] U.S. Federal Census 1900 U.S. Federal Census, by Ancestry.com, ED225. Dwelling 167. [S244] U.S. Federal Census 1910 U.S. Federal Census, by Ancestry.com, ED283. Dwelling 92. Name Variation John M. Larson was also known as John Larsen Kongsvik. John M. Larson was born on 17 April 1862 at near Throndhjen, Norway. He was the son of Lars Olsen Lykken and Berit Johnsdatter Stene. He married Guri J. Rye, daughter of John Rye and Anne (? ), on 30 August 1884. John M. Larson died on 23 November 1928 at Yankton, South Dakota, at age 66. He was buried after 23 November 1928 at Meldal Cemetery, Yankton, South Dakota. 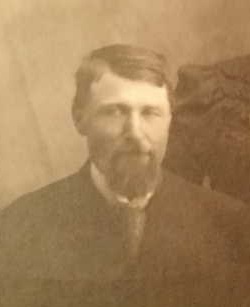 John M. Larson immigrated in 1881 to Yankton, South Dakota. 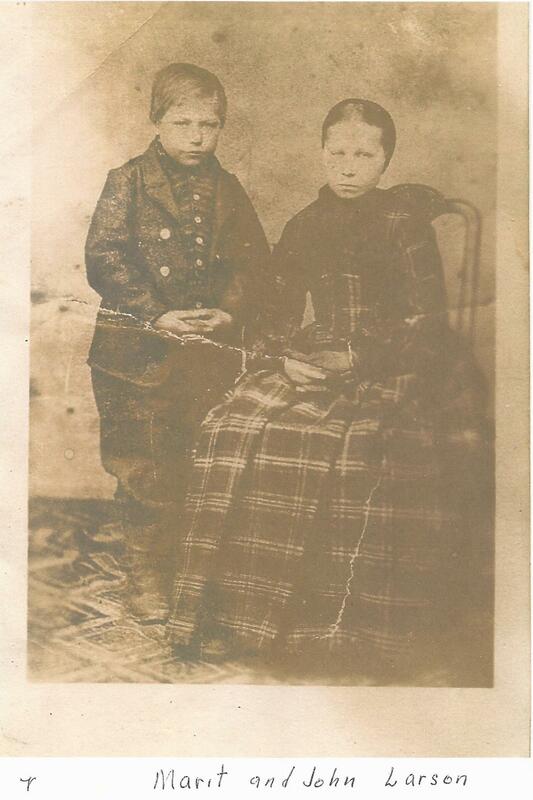 Before 1894 photo of children of Lars Olsen Lykken and Berit Johnsdatter Stene. [S245] U.S. Federal Census 1900 U.S. Federal Census, by Ancestry.com, ED354. Dwelling 145. [S244] U.S. Federal Census 1910 U.S. Federal Census, by Ancestry.com, ED448. Sheet 6B. Stamp 198B. [S243] U.S. Federal Census 1920 U.S. Federal Census, by Ancestry.com, ED268. Dwelling 274. [S21] Doane Robinson, History of South Dakota Volume 1, pages 737-738. Married Name 30 August 1884 As of 30 August 1884,her married name was Larson. Guri J. Rye was born in January 1857 at Norway. She was the daughter of John Rye and Anne (?). 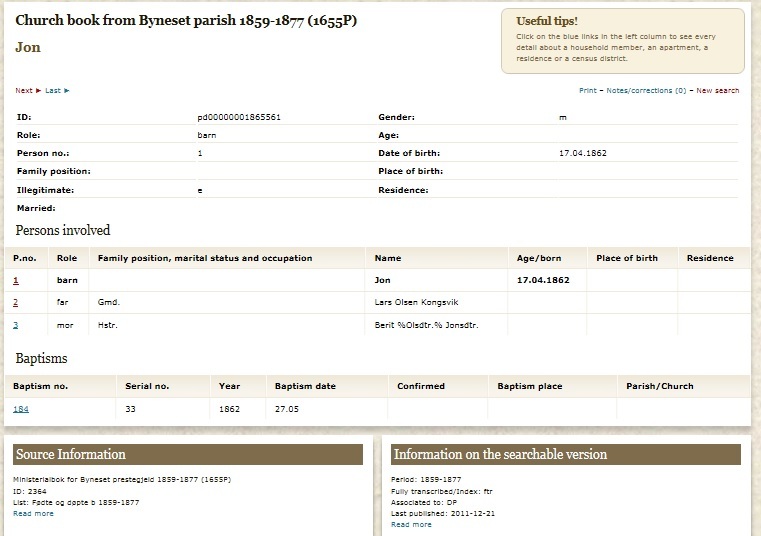 Guri J. Rye married John M. Larson, son of Lars Olsen Lykken and Berit Johnsdatter Stene, on 30 August 1884. Guri J. Rye died on 9 December 1927 at Yankton, South Dakota, at age 70. She was buried after 9 December 1927 at Meldal Cemetery, Yankton, South Dakota. Guri J. Rye immigrated with John Rye and Anne (?) in 1872. Guri J. Rye had 8 with 6 living in 1900 children. She had 9 with 7 living in 1910 children. 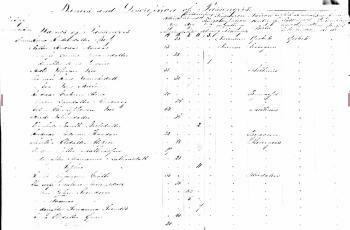 [S246] U.S. Federal Census 1880 U.S. Federal Census, by Ancestry.com, NA Film Number T9-0115 Page Number 511C. Name Variation Karen Larsdatter Kongsvik was also known as Kongsvig. Name Variation Karen Larsdatter Kongsvik was also known as Caroline. 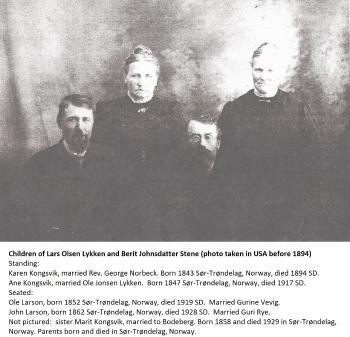 Name Variation Karen Larsdatter Kongsvik was also known as Larsen. Name Variation Karen Larsdatter Kongsvik was also known as Kern. Name Variation Karen Larsdatter Kongsvik was also known as Carin. Married Name 4 November 1869 As of 4 November 1869,her married name was Norbeck. 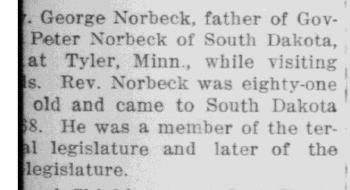 She married Reverand George Persson Norbeck, son of Peder Norbeck and Ingeborg Olson, on 4 November 1869 also reported as Dec 1869. Karen Larsdatter Kongsvik died on 6 April 1894 at Charles Mix, South Dakota, at age 50. She was buried after 6 April 1894 at Bloomington Cemetery, Platte, Charles Mix, South Dakota. [S247] U.S. Federal Census 1870 U.S. Federal Census, by Ancestry.com, Page 30. Dwelling 295. 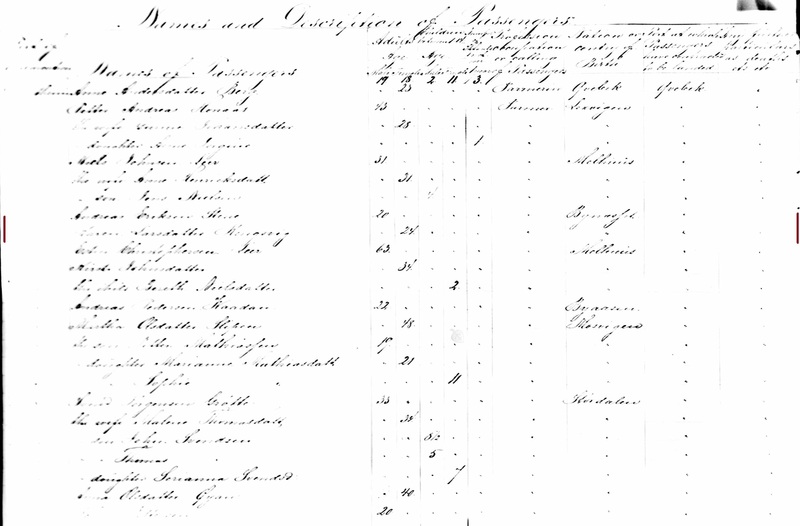 [S246] U.S. Federal Census 1880 U.S. Federal Census, by Ancestry.com, NA Film Number T9-0112. Sheet 360D. ED9. Dewlling 248. Name Variation Reverand George Persson Norbeck was also known as Goran Person Kjostad. Name Variation Reverand George Persson Norbeck was also known as Gjoran Persson. Name Variation Reverand George Persson Norbeck was also known as Goeran. Name Variation Reverand George Persson Norbeck was also known as Goran Persson. Reverand George Persson Norbeck was born on 13 October 1836 at Jämtland, Sweden, also reported as Sep 1831. He was the son of Peder Norbeck and Ingeborg Olson. 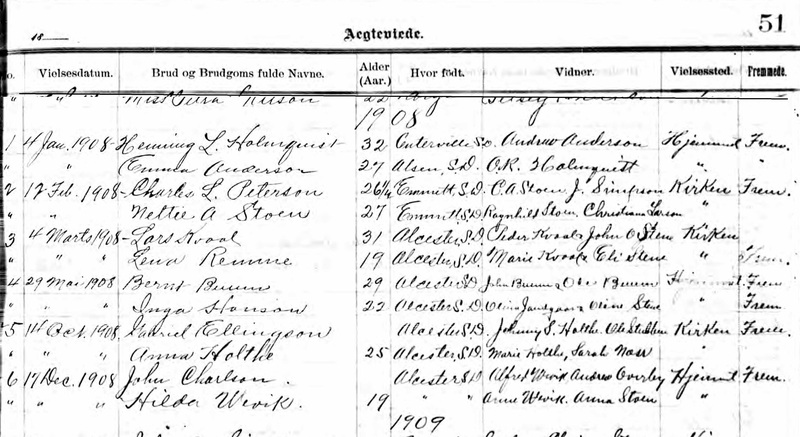 Reverand George Persson Norbeck married Karen Larsdatter Kongsvik, daughter of Lars Olsen Lykken and Berit Johnsdatter Stene, on 4 November 1869 also reported as Dec 1869. Reverand George Persson Norbeck married Kristina Oluffina Foss, daughter of Peder Foss and Anne Rask, in December 1895 at 2nd marriage for both, Sioux City, Iowa. Reverand George Persson Norbeck died on 17 July 1917 at Charles Mix, South Dakota, at age 80 George Norbeck obituary: Rev. 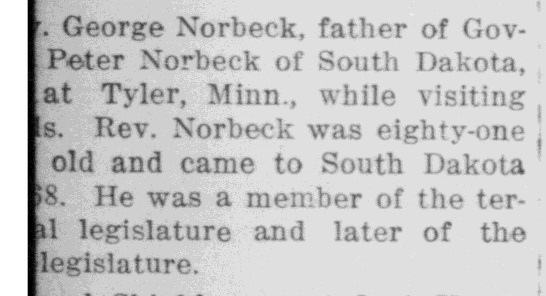 George Norbeck, father of Governor Peter Norbeck of South Dakota, died at Tyler, Minn., Tuesday, where he had been visiting relatives. Rev. 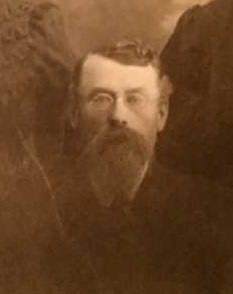 Norbeck was eighty-one years old and came to South Dakota in 1868. He was a member of the territorial legislature and later of the state legislature. He was buried after 17 July 1917 at Bloomington Church Cemetery, Platte, Charles Mix, South Dakota. Ship Name: Brazilian. 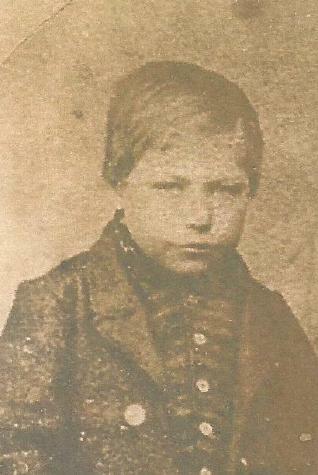 He migrated on 19 July 1866 at Milwaukee, Wisconsin. He migrated in 1868 at Dakota Territory. 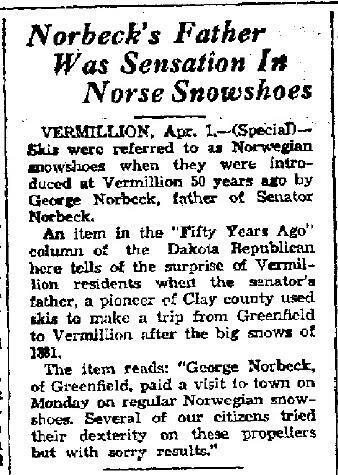 In 1881 at Vermillion, South Dakota, George Norbeck introduces Norwegian snowshoes (skis) to SD. welfare of the state.5 In August 1959 Rev George Norbeck, first pastor of Tabor Lutheran church. [S245] U.S. Federal Census 1900 U.S. Federal Census, by Ancestry.com, Year: 1900; Census Place: Platte, Charles Mix, South Dakota. [S244] U.S. Federal Census 1910 U.S. Federal Census, by Ancestry.com, Year: 1910; Census Place: Platte Ward 2, Charles Mix, South Dakota; Roll: T624_1478; Page: 8A; Enumeration District: 0087; FHL microfilm: 1375491. [S195] South Dakota, "History of Dakota Territory" by George W. Kingsbury, Vol. V (1915), pages 1248-1251. Name Variation Ole Larson was also known as Ole Larsen Kongsvik. Name Variation Ole Larson was also known as Larsen. Ole Larson was born on 4 April 1852 at Byneset, Sør-Trøndelag, Norway. 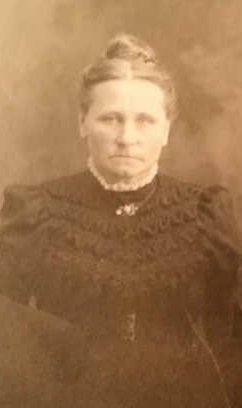 He married Gurine Larsdatter Vevig, daughter of Lars Olsen and Jodda Larsdatter, circa 1876. Ole Larson died on 3 January 1919 at Charles Mix, South Dakota, at age 66. He was buried after 3 January 1919 at Bloomington Church Cemetery, Platte, Charles Mix, South Dakota. [S21] Doane Robinson, History of South Dakota Volume 1, Pg 737-738. [S253] Charles Mix SD Index to 1906 Atlas, by Charles Mix SD, page 16. Name Variation Anne Olsdatter was also known as Wevik. Name Variation Anne Olsdatter was also known as Anna Olsdatter Krigsbakken. Anne Olsdatter was born in 1832 at Krigsbakken, Byneset, Norway. She was the daughter of Ole Andersen and Berit Olsdatter. Josie J. Jamtgaard was born on 3 October 1894 at Alcester, Union, South Dakota. Josie J. Jamtgaard married Alfred Rudolph Abraham, son of Andrew Abraham and Lizzie Carrie Satter, on 4 February 1916 at Sioux City, Woodbury, Iowa. She was buried on 16 December 1969 at Emmanuel Lutheran Cemetery, Beresford, Union, South Dakota. Name Variation Levern Orval Abraham was also known as Luverne Orval. Name Variation Levern Orval Abraham was also known as Lavern. Levern Orval Abraham was born on 7 November 1916 at South Dakota. Levern Orval Abraham was baptized on 30 November 1916 at Roseni Lutheran Congregation, Beresford, Union, South Dakota. He died on 15 February 1993 at age 76. Levern Orval Abraham obtained US Social Security Card at South Dakota; last residence Kent, King, Washington. Judith Lauretta Wevik was born on 9 March 1915 at Union, South Dakota. She was the daughter of Alfred O. Wevik and Ida Husby. Judith Lauretta Wevik died on 29 February 1976 at heart attack, Sioux Falls, Minnehaha, South Dakota, at age 60. Judith Lauretta Wevik obtained US Social Security Card at South Dakota. Married Name 16 August 1952 As of 16 August 1952,her married name was Johnson. Olive Ella Wevik was born on 6 August 1916 at South Dakota. Olive Ella Wevik married Palmer O. Johnson, son of Helge Oliver Johnson and Julia Caroline Anderson, on 16 August 1952 at Canton, Lincoln, South Dakota. Olive Ella Wevik died on 12 June 2009 at age 92 Funeral services for Olive E. Johnson of Sioux Falls will be held at 11:00 a.m. Monday, June 15, 2009 at Peace Lutheran Church. Visitation with the family present will be from 6:30 to 8:00 p.m. Sunday at Heritage Funeral Home. Olive was the former administrator of the Good Samaritan Nursing Homes in Canton and Canistota. She is survived by her two daughters, Paulette (P.J.) Dave Dobias, Henry, S.D., Myrna (Brian) Knutson, San Diego, CA; one sister, Delores Cleveland, Sioux Falls; one brother, Delmar (Joyce) Wevik, Chamberlain, S.D; 3 grandchildren; and 7 great grandchildren. Even Ingebretsen Husby was born on 16 June 1856 at Buvika, Trondelag, Norway. He married Johanna Steffensdatter Olson, daughter of Steffen Stokke Olson and Anna Johnason, on 10 December 1885 at Gayville, South Dakota. Even Ingebretsen Husby died on 31 January 1931 at Lincoln, South Dakota, at age 74. 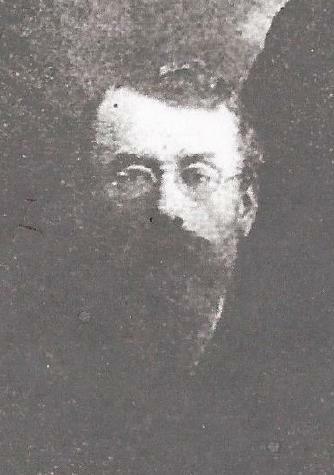 Even Ingebretsen Husby immigrated in 1881. [S243] U.S. Federal Census 1920 U.S. Federal Census, by Ancestry.com, ED143. Dwelling 93. [S9] South Dakota, South Dakota Birth Records South Dakota, State File Number: 534677 (unknown file date). [S9] South Dakota, South Dakota Birth Records South Dakota, State File Number: 534678 (unknown file date). Name Variation Johanna Steffensdatter Olson was also known as Johane. Married Name 10 December 1885 As of 10 December 1885,her married name was Husby. Johanna Steffensdatter Olson was born on 1 June 1863 at Engereie, Jevnaker, Hadeland, Norway. She was the daughter of Steffen Stokke Olson and Anna Johnason. Johanna Steffensdatter Olson married Even Ingebretsen Husby on 10 December 1885 at Gayville, South Dakota. Johanna Steffensdatter Olson died on 17 October 1952 at Lincoln, South Dakota, at age 89. 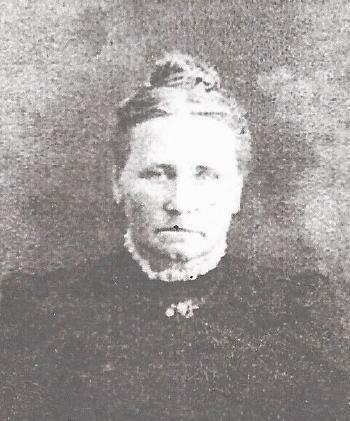 Johanna Steffensdatter Olson immigrated in 1877. She had 5 with 5 living in 1900 children. She had 6 with 6 living in 1910 children. [S246] U.S. Federal Census 1880 U.S. Federal Census, by Ancestry.com, NA Film Number T9-0112 Page Number 382B. Palmer O. Johnson was born on 18 January 1915 at South Dakota. He was the son of Helge Oliver Johnson and Julia Caroline Anderson. Palmer O. Johnson married Olive Ella Wevik, daughter of Alfred O. Wevik and Ida Husby, on 16 August 1952 at Canton, Lincoln, South Dakota. Palmer O. Johnson died in October 1984 at age 69. Palmer O. Johnson obtained US Social Security Card at South Dakota; last residence Sioux Falls, Minnehaha, South Dakota. [S243] U.S. Federal Census 1920 U.S. Federal Census, by Ancestry.com, ED138. Dwelling 69. [S250] U.S. Federal Census 1930 U.S. Federal Census, by Ancestry.com, ED42-14. Dwelling 113. Helge Oliver Johnson was born on 1 November 1888 at South Dakota. He was the son of Peder Johnson and Pauline (?). Helge Oliver Johnson married Julia Caroline Anderson on 20 December 1911 at Lincoln, South Dakota. Helge Oliver Johnson died in October 1971 at age 82. Helge Oliver Johnson obtained US Social Security Card at South Dakota; last residence Canton, Lincoln, South Dakota. Married Name 20 December 1911 As of 20 December 1911,her married name was Johnson. Julia Caroline Anderson was born on 15 January 1893 at South Dakota. She married Helge Oliver Johnson, son of Peder Johnson and Pauline (? ), on 20 December 1911 at Lincoln, South Dakota. Julia Caroline Anderson died in May 1981 at age 88. Julia Caroline Anderson obtained US Social Security Card at South Dakota; last residence Canton, Lincoln, South Dakota. Irving Alfred Wevik was born on 26 March 1920 at Union, South Dakota. He was the son of Alfred O. Wevik and Ida Husby. Irving Alfred Wevik died on 13 January 1994 at Phoenix, Maricopa, Arizona, at age 73. Irving Alfred Wevik obtained US Social Security Card at Iowa; last residence Phoenix, Maricopa, Arizona. Married Name 14 December 1946 As of 14 December 1946,her married name was Wevik. Myrtle C. Jensen was born on 8 October 1922. Myrtle C. Jensen obtained US Social Security Card at South Dakota; last residence Phoenix, Maricopa, Arizona. [S184] Beresford Republic Newspaper, Jan 15. Ernest Oniel Wevik was born on 30 September 1923 at farmhouse, Alcester, Union, South Dakota. Ernest Oniel Wevik died on 24 January 1979 at lung cancer, Beresford, Union, South Dakota, at age 55. Ernest Oniel Wevik obtained US Social Security Card at South Dakota. Married Name 19 April 1952 As of 19 April 1952,her married name was Cleveland. Delores Ilene Wevik was born on 19 April 1932 also reported as circa 1925. Delores Ilene Wevik married Harold Orville Cleveland, son of Ingvold Haldorson Cleveland and Anna Malina Nelson, on 19 April 1952 at Canton, Lincoln, South Dakota. Delores Ilene Wevik lived in April 2008 at 1536 S Southeastern Ave, Sioux Falls, Minnehaha, South Dakota. She lived in June 2009 at Sioux Falls, Minnehaha, South Dakota. Harold Orville Cleveland was born on 5 October 1925 at Lake Preston, South Dakota. He was the son of Ingvold Haldorson Cleveland and Anna Malina Nelson. Harold Orville Cleveland married Delores Ilene Wevik, daughter of Alfred O. Wevik and Ida Husby, on 19 April 1952 at Canton, Lincoln, South Dakota. Harold Orville Cleveland died on 7 November 1987 at age 62. On 18 January 1945 at U.S. World War II Army Enlistment, Fort Snelling, Minnesota, Name: Harold O Cleveland Birth Year: 1925 Race: White, citizen (White) Nativity State or Country: South Dakota State: South Dakota County or City: Lincoln Enlistment Date: 18 Jan 1945 Enlistment State: Minnesota Enlistment City: Fort Snelling Branch: No branch assignment Branch Code: No branch assignment Grade Code: Private Term of Enlistment: Enlistment for the duration of the War or other emergency, plus six months, subject to the discretion of the President or otherwise according to law Component: Selectees (Enlisted Men) Source: Civil Life Education: Grammar school Civil Occupation: Geographer Marital Status: Single, without dependents Height: 00 Weight: 000. 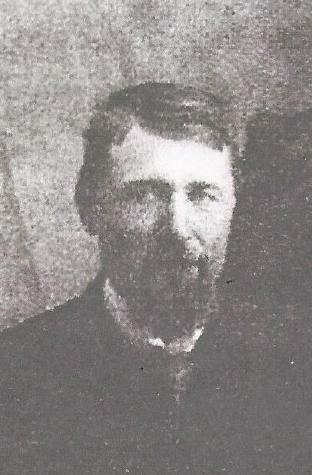 Ingvold Haldorson Cleveland married Anna Malina Nelson. Married Name Her married name was Cleveland. Anna Malina Nelson married Ingvold Haldorson Cleveland. Married Name 17 December 1908 As of 17 December 1908,her married name was Karlsen. Married Name 17 December 1908 As of 17 December 1908,her married name was Charlson. Married Name 15 April 1944 As of 15 April 1944,her married name was Anderson. Hilda Wevik was born on 7 April 1889 at Spink, Union, South Dakota. Hilda Wevik married John Charlson, son of Karl Johan Martinussen and Margaret Lykken, on 17 December 1908 at Alcester, Union, South Dakota, also reported as 17 Dec 1908. Hilda Wevik married August A. Anderson on 15 April 1944 at Sioux City, Iowa. Hilda Wevik died on 20 August 1965 at Akron, Plymouth, Iowa, at age 76 Hilda (Wevik) Anderson obituary. She was buried on 23 August 1965 at Union Cemetery, Remson, Plymouth, Iowa, tombstone listed as Hilda Charlson (first husband's surname). 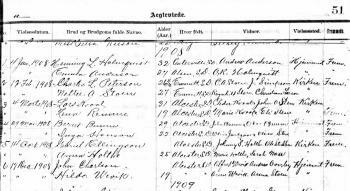 1 January 1925 Sioux City, Woodbury, Iowa Hilda Wevik appeared on the census of 1 January 1925 in the household of John Charlson at Sioux City, Woodbury, Iowa. Hilda Wevik had 1 with 1 living in 1910 children. She was a witness when Emil Fred Klemme and Anna Marie Lykken were The 13th annual Lykken reunion was held Sunday, August 17, at the home of Mr. And Mrs. Emil Klemme at Akron. Married Name before 1856 As of before 1856,her married name was Kane. Mary McCollon was born in 1825 at Ireland. She married Henry Kane, son of (?) Kane, before 1856. Mary McCollon died on 28 March 1900. She was buried after 28 March 1900 at St. Margaret Catholic Cemetery, Kimball, Brule, South Dakota, Name: Kane, Mary b. 1825 d. 28 Mar 1900 age: 75y Section: A Block: 2 Lot: 24 Grave: 2. 1895 South Dakota State Census, Plainfield, Brule, South Dakota Mary McCollon and Henry Kane appeared on the census of 1895 at South Dakota State Census, Plainfield, Brule, South Dakota. Name Variation Henry Kane was also known as Frank. Henry Kane was born in March 1857 at Wisconsin. Henry Kane married Julia Moore, daughter of James Moore and Mary (? ), circa 1886. Henry Kane died after April 1930. [S246] U.S. Federal Census 1880 U.S. Federal Census, by Ancestry.com, NA Film Number T9-1429 Page Number 173B.